So far, 2016 has been a record hot year however you slice it—but the Arctic is on fire. 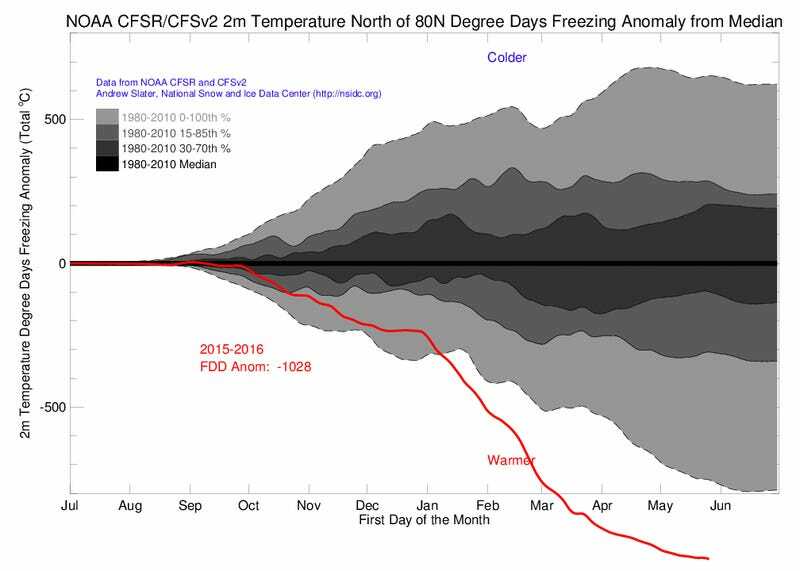 A recently updated graph by the National Snow and Ice Data Center’s Andrew Slater shows just how freakishly warm it’s been in what is ostensibly one of the coldest regions of our planet. This prolonged hot flash will come as no surprise to those who have been paying attention. After all, 2016 started out with a bang, as temperatures at the North Pole skirted the freezing point on New Year’s Eve. (They’re normally ~30 degrees Celsius lower.) Back in March, the NSDIC announced that Arctic sea ice hit a record low this winter, and just last week, NOAA’s Barrow Observatory confirmed that it had recorded its earliest snowmelt date yet: May 13th. All signs are now pointing to a record low summertime sea ice extent, meaning more fresh meltwater entering the Arctic ocean and less reflective, icy surface to deflect the sun’s rays. The result? The Arctic absorbs even more heat and melts even faster. The roof is on fire, and time is running out to fix it.